Guzmán de Aguilar is a Managing Partner of Piniés & Aguilar Asociados, S.L. He supports clients in financial communications, investor relations, corporate and marketing communications and issues management drawing from his experience in banking, brokerage, consulting and high technology companies. 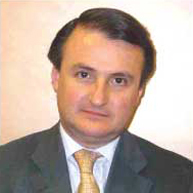 Guzmán earned his degree in economics from Complutense University and his MBA from the IESE business school in Madrid.